Today is Neupogen day 5, and I am very happy to report, it is the last in this course of therapy. Today was my apheresis day. Please notice that I used the past tense and the singular. If you recall, I was scheduled for two days of apheresis because this is what is usually required to harvest (collect) 5 million stem cells as a minimum; with 10 million being the goal that the doctors prefer their patients to have collected. Well [drum roll please] at the mid-point of the scheduled total collection time of 6 hours, a sample of my stem cells collected thus far was taken, and when the results came back, I was at 16.1 million cells collected!! It had taken the lab about 1-1/2 hours to complete their analysis, and then as you might imagine, the doctor monitoring me and results, said “Double check them please”. By the time that could all be completed, a total of 2 hours post mid-point sampling had gone by before they could be sure that all was good, and that I could be disconnected, and not have to come in for a second day. My rough estimate is that there should be in excess of 25 million cells collected. I wish to thank the talented team of nurses at the Sylvester Comprehensive Cancer Center Apheresis Department, Marcia, Jesus, and Monica, for their most excellent care. In the time I was there I learned a lot about how the collecting machine works and the various safeguards built in to the whole process. Tomorrow I will get the exact count and perhaps some idea as to when the actual transplant phase might start. Today is Neupogen day 3. I had my third Neupogen shot this morning at 9 AM. I have started to feel occasional pains in my spine that I believe are due to the Neupogen. Most of the time I notice no pains, but some times they are acute pulses that last for up to a minute. I will take acetaminophen if I need it, but so far, I really cannot say that I have. 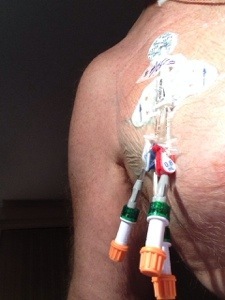 Tomorrow morning is another Neupogen shot, and I get the central venous catheter installed at 2 PM at Sylvester. Today is Neupogen day 1. This morning Kathleen and I drove to Miami so I could get my first Neupogen injection. It is given subcutaneously, and stings some during the injection. Since this was my first experience with Neupogen, the nurse, Vibeka, asked that I stay for a half-hour to make sure there were no immediate side effects. There was also another blood draw because there was apparently some confusion over the proper form required to test for infectious disease markers. That was quickly resolved this morning so the test will be run. After that, Kathleen and I drove up to Boca Raton to attend our usual Sunday service. A little shopping on the way home and a small nap and all is good. No untoward effects. Today is KDd 4-14. Tomorrow, I was originally scheduled to have my 5th dose of Kyprolis and my third dose of Doxil together with the dreaded 16 mg of dexamethasone. Instead, today I had my consent meeting at Sylvester Comprehensive Cancer Center in Miami with Krishna Komanduri. He carefully explained the informed consent that I did sign for the Autologous Stem Cell Transplant. This ASCT process will start on Sunday, 9/22 with my first Neupogen injection. This drug is also known as filgrastim or G-CSF, or Granulocyte Colony Stimulating Factor. It’s primary purpose is to stimulate the production of extra blood stem cells in the marrow so that these may be more easily collected during the aphoresis collection process. We want as many as we can get because these are the cells I get back after the high dose chemo. As for me, right now I’m feeling great. Kathleen and I went out to dinner after our meeting in Miami to one of our favorite restaurants, The Sea Watch. We learned that all bottles of wine are 50% off on Wednesday evenings. So we had a nice Napa Chardonnay with Kathleen’s shrimp and my scallops.